Occasionally, our great cadre of economists develops a new indicator, like the one you see below. I’ve been saying in my talks from coast to coast that millennials are smart and take us places we sometimes don’t expect. That is certainly true of the millennials at ITR Economics. 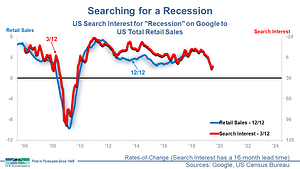 Using how often "recession" is a search interest on Google, one of our younger economists has developed a brand new – and highly useful – leading indicator to Retail Sales. The more “recession” is searched, the more the Search Interest rate-of-change value goes up. By inverting the Search Interest rate-of-change (scaled on the right on the chart), our economist developed a 16-month leading indicator to Retail Sales. This is what the leading indicator is telling us:Search Interest rate-of-change (scaled on the right on the chart), our economist developed a 16-month leading indicator to Retail Sales. Although Retail Sales are growing at a healthy pace now, expect that trend to change in 2019. The slowdown in Retail Sales growth is likely to be pronounced enough to mean GDP and Industrial Production will at best stall. If the tentative reversal holds (see the red line on the chart), we may be seeing an early empirical sign regarding a new business-cycle rising trend developing in 2020 (stay tuned for more on that one). I don’t think many people want to see a stall in the economy or their specific industry or company. So don’t accept it. If the economic winds are fading for 2019, figure out how you are going to reset your own company sails, or man some oars, and keep the growth going by virtue of your ingenuity.